Along with many other people and fellow councilors, I visited the public exhibition that Sainsbury's put on at the Ursuline College on Friday evening. Before I comment any further, I should say that it happened there because Sainsbury's booked the school hall because it's right next-door to Hundreds Farm and not because the Ursuline is involved, as the Head Teacher, told me, in any way. The application will be a subject for discussion at Monday's WWRA meeting which will take place at the Westbrook bowls club at 7pm - on the Royal Esplanade - and so if you plan to attend, you best arrive early as there is not a huge amount of seating space. I had a word with WWRA chairman, Councilor Tom King, last night and it's likely we will attempt to hold a larger public meeting at some date in the near future, involving Westgate and Birchington traders and residents and which will likely take place at the Westgate Pavillion. On the way up to the Ursuline, I dropped in on the Lymington road shops to look for opinions there as well as in Westgate. First off, I raised the matter in Cabinet a week ago and discussed it it at my monthly 'shadow' meeting with the council's Director of Planning Services and so residents can be assured that all the right buttons are being pressed as we wait for the full application from the company. From what I can judge, the community is polarised between those who think that a Sainsbury's on the Canterbury road is a good idea and those, mostly traders, do don't. 1) That a right turn from the Canterbury Road into Hundreds Farm has already been rejected by KCC on road safety and access issues, which is why the housing development was sold to Sainsbury's. Just because the company is prepared to fund a new set of traffic lights and road changes, doesn't appear to remove the original argument on a busy road with two schools within two hundred yards. 2) Westgate is a planned town with a sensitive economy showing encouraging signs of recovery. 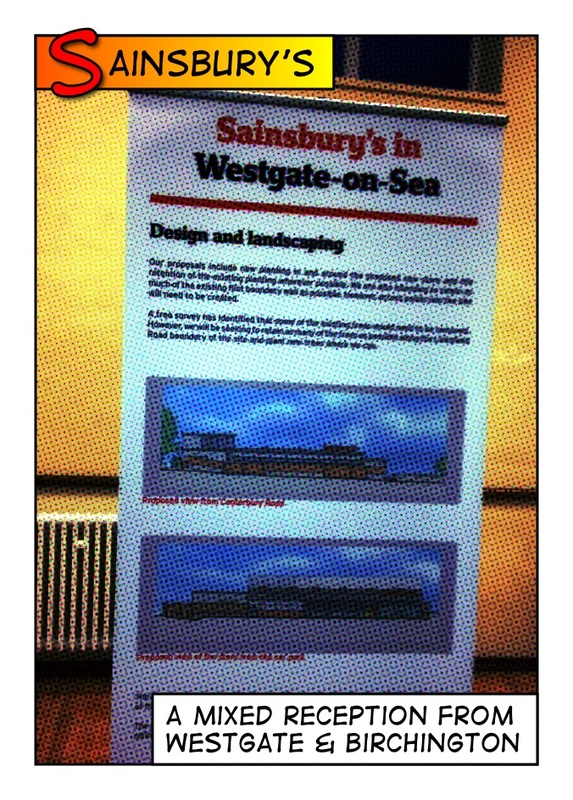 Birchington would be equally sensitive to a Sainsbury's appearing. Any application, regardless of the jobs being offered, would have to be measured against the potential impact on existing jobs and a very fragile local economy. 3) Placing a commercial unit of this size on the Canterbury Road may well set a precedent, change the nature of the town and encourage further commercial development on green space. If readers look back at Thanet Life over five years ago, then they will see that before I was a councillor, I joined in the community effort to protect the playing field between the Ursuline College and King Ethelberts School. People are quite rightly concerned that if the Sainsbury's application is approved, then it would be only a matter of time before the vacant playing field came under threat. Furthermore, the arrival of Sainsbury would likely decimate the local shops in Lymington Road and effectively split Westgate in two on a line defined by the Canterbury Road. My last thought is that a new supermarket would give enough infrastructure impetus to encourage an expansion of the social housing on the southern side of Westgate at some point in the future. So there you have the basic arguments and there may be more. By all means add your own ideas and views on whether this is in fact a good idea or an unwelcome visitor. Finally, if you have friends who are not aware of this weblog, please point them in this direction as one of the quickest and most effective ways of adding comment on a very contentious local issue. I haven't formed a full opinion yet. I love the quiet village feel of shopping in Westgate but would like a larger range of produce than is currently offered by the Co-op, local independants and M&S at the garage.... I suppose we wait for KCC and whether they will allow changes to the road first. Thank you for a well balanced report. It would appear that the Ursuline are furious at being had over by a consultancy firm, and were not aware of the planned development. They are also open to being asked to host a residents general meeting in order to maintain a neutral stance. The consultants were very misleading about some points including the access. There will be an additional access on Canterbury Road, just up from the bus stop, for there delivery lorries. 'Not very clear on the plans' !!! Also the fact that the Canterbury Road will then have double yellow lines forcing the School parents to wait in the Sainsburys car park! Room for school staff parking all day as well? There are also some interesting points raised in the Will of the late Westgate benefactor Ivor Read. The land was in trust with conditions attached and it will be interesting to see if these conditions still apply. As my shop shuts at 5pm, I must have missed you on Friday evening if you visited the Lymington stores. Do feel free to come up at any time though. I am not sure about this one either, their employment figures seem very high for the size of the store, I guess this would mean 24 7 opening. Whether either Westgate or Birchington shopping centres can survive as things are at the moment would seem uncertain, I think it is the mobile internet more than anything else that is the new problem. With the supermarkets and out of town shopping in general, perhaps we should have taken more notice of the decimation of small towns in America and designated areas where shops could be and shops couldn’t. I suppose eventually even if we forger the environmental considerations and just consider the financial cost, we will probably have to return to a situation where shops are in the middle of centres of population. Wandered down to Edwards earlier today to get sweets for the sprog, I saw plenty of "SOS Say No to Sainsburys" posters in shop windows.